Note: the photo and the 1867 book "Beans History & Directory of Nevada County, California" identify Eureka as being in Nevada County, however the USGS place names database does not have a Eureka populated place for this county. There is a Eureka in neighboring Sierra County, and with the help of our Facebook fans we have concluded that the county lines were probably redrawn at some point and the Eureka in Sierra County is indeed the town profiled here. 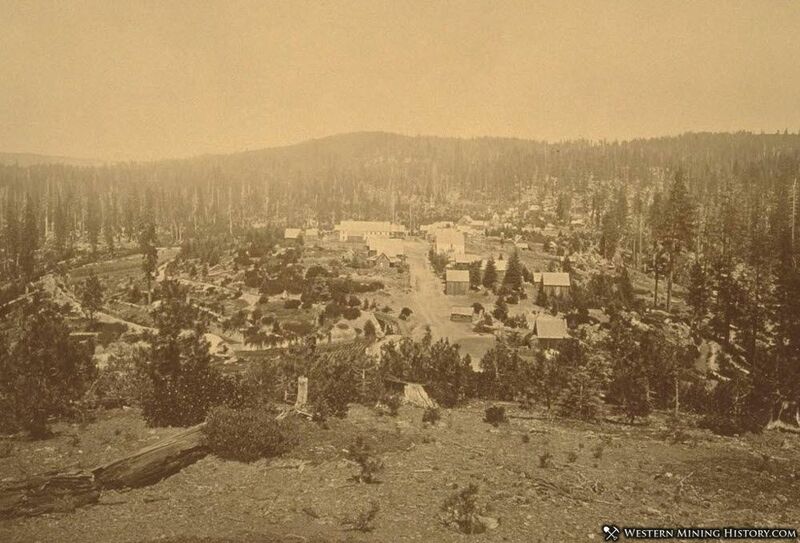 The town of Eureka, from which the township derived its name, is situated on the summit of the divide between the South and Middle Yuba, and the first settlements were made in 1850. The surrounding mines being mostly shallow, surface diggings, requiring no capital and but little preliminary labor to open, had peculiar attractions for the restless, roving prospectors who swarmed over the mining regions at that early day, and the result was that Eureka suddenly rose to a town of considerable importance. The quartz excitement of 1851, in other parts of the county, affected the miners of Eureka, many of whom neglected their placer claims during the season when water could be procured, and went to work endeavoring to prospect and open the numerous quartz ledges in the vicinity. The result, as may be supposed, proved highly disastrous, and the miners again turned their attention to the surface diggings. These continued to yield abundantly for five or six years, numerous adventurers making fortunes, some of whom returned to their old homes at the East to enjoy the result of their toil, but the majority spending their money with a recklessness and abandon characteristic of early California life. For six or seven years Eureka was a prosperous town, full of life and bustle; but the surface diggings gradually becoming exhausted, the town declined in population, the miners leaving to prospect for new diggings, and the traders and business men closing out their stocks and seeking new localities. For six or eight years the town wore a decaying appearance, the principal resource being the yield of the claims of five or six companies, that still worked surface diggings when water could be procured, which has been about five months of the year. Within the past year or two, the old residents, with some new comers, have again turned their attention to the quartz mines, with very favorable prospects of developing an important quartz mining district. This has encouraged the inhabitants to hope for a renewal of former prosperous times. The present population of Eureka, including the miners in the vicinity who make it their headquarters, is about 300. The town has one general variety store, two hotels, a livery stable, blacksmith shop, etc. Eureka is one of the few towns in the county that has not suffered from disastrous fires."